Barbara Gordon, sculpted by the legendary Clayburn Moore. Actress Yvonne Craig from the 1966 Batman TV series. The resin statue stands 12-inches tall on a Bat-logo base. The Batgirl of your dreams can be the centerpiece of your statue collection! 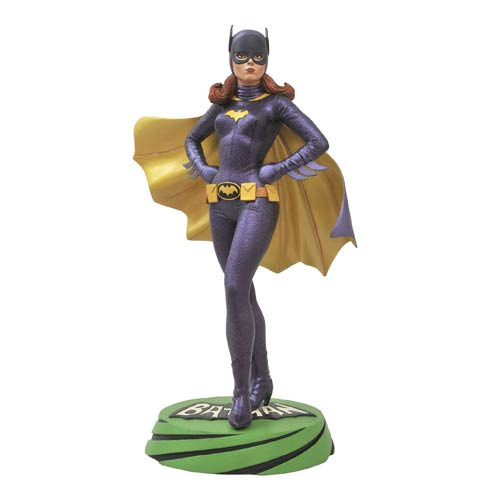 The Batman 1966 TV Series Batgirl Premier Collection Statue presents actress Yvonne Craig as the unforgettable sidekick to Batman and Robin, as she appeared in the third season of the classic TV show. Sculpted by the legendary Clayburn Moore in her distinctive purple-and-yellow crime-fighting costume, this resin statue of Barbara Gordon stands about 12-inches tall on a Bat-logo base. This Bat-tastic statue come packaged in a full-color box with a certificate of authenticity. Limited to 1,966 pieces. Ages 13 and up.